Bike Share systems are sweeping the nation, popping up in cities big and small. They are a great asset to commuters, transient workers, and anyone who doesn’t own a car or wants to limit their carbon footprint by not driving around – a group that is growing rapidly in this country. The Washington Post has a very interesting article that focuses not so much on the environmental and social aspects of a D.C.’s Bike Share program, but the economics and business side of it. 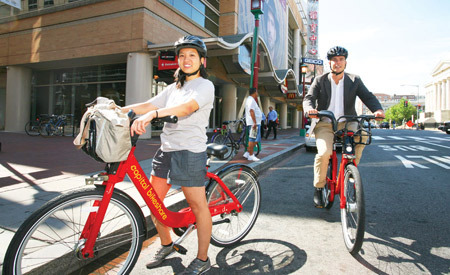 The District’s Capital Bikeshare network has more shared bikes in circulation than any other region in the nation (when you include Arlington, Alexandria, and metro D.C.) with 1,890 bikes and 22,000 members. The article dives into the system used to keep popular racks stocked with bikes, the effect on drawing young professionals to live there, prices compared to other forms of public transportation, etc. If you are interested in bike shares, this is a must read. A petition has been posted to Change.org demanding that the National Park Service repeal the backcountry camping fee in Great Smoky Mountains National Park. The $4 per person, per night fee was implemented in February of 2013 and is being used to increase customer services to backcountry campers. This has rankled many of those who believe they should not have to pay a fee if they do not use amenities, should be able to buy a year pass, or should be able to sleep in GSMNP more than the 60 day limit. The end of the petition states: “We no longer have confidence that Superintendent Dale Ditmanson can effectively and efficiently manage the day to day operations of Great Smoky Mountain National Park in the best interest of the citizens who use this most beloved of national parks.” Ouch. As of this writing, the petition had 97 of the 100 signatures needed. According to a recent study by Steve Morse, an economist and associate professor in the University of Tennessee Knoxville’s Department of Retail, Hospitality, and Tourism Management and commissioned by the Ocoee River Outfitters Association and the America Outdoors Association, Tennessee’s Ocoee River was the most visited whitewater river in the U.S. With 229,542 visitors in 2012, the Ocoee trumped the Arkansas River in Colorado (208,329), the Pigeon River also in Tenn. (169,060), The Nantahala in N.C. (165,906), and the Lehigh River in Pennsylvania (110,422). The study states that visitors left a $42.8 million economic impact and supported 622 jobs the Ocoee Region. That’a a lot of hooch.